Upper Mustang is one of the two major divisions of Mustang district in northwestern Nepal (the other division is Lower Mustang). It borders to Tibetan plateau on the Chinese side and Dolpo & Manang on the Nepalese side. Mustang boasts the presence of Muktinath, a popular pilgrimage among Buddhists and Hindus. Upper Mustang is all about desert-like topography. 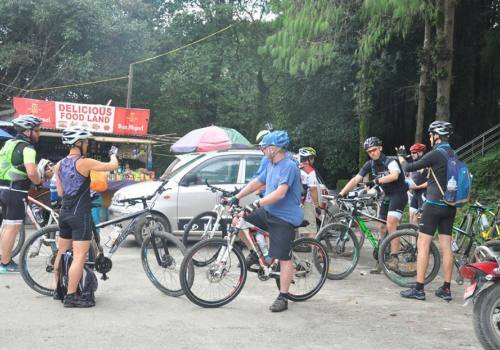 Hence, the cycling experience on this region can be full of adventure. 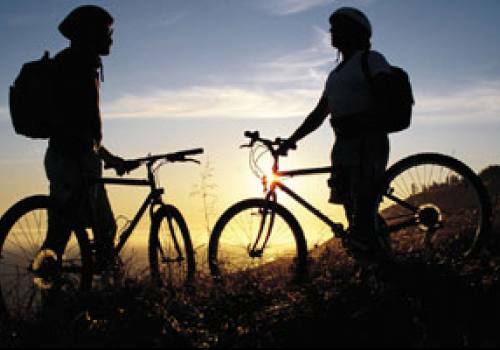 This mountain biking tour is designed in such a way that one can enjoy biking along with breath-taking sceneries. The tour will take you to Pokhara from Kathmandu, then to Muktinath in Jomsom. 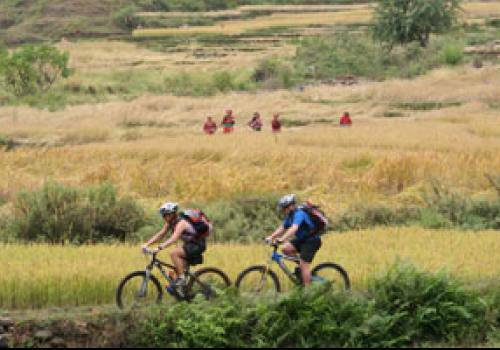 Then, the main biking routes will follow, including Chele, Syangboche, Charang, Lo-Manthang, Kagbeni, to name some. 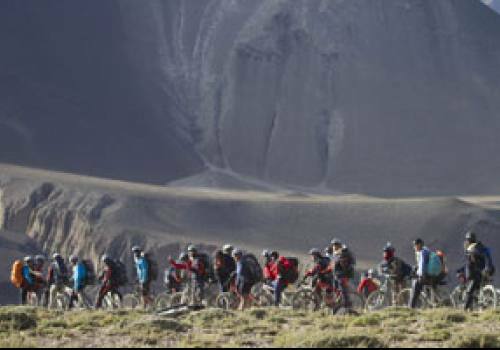 Sightseeing, mountain biking, pilgrimage, adventure & fun activities, all are the components of this amazing tour. Day 01:Arrival in Kathmandu airport (1345meters). 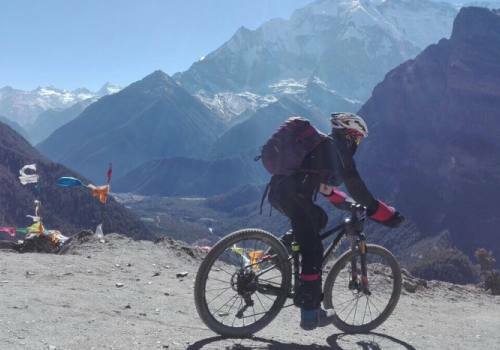 Our airport representative will be receiving you at Tribhuvan International airport, Kathmandu and s/he will be displaying an Nepal Mountain Bike signboard outside the airport terminal. You will be then transffered to your respective hotel in our private tourist vehicle. Overnight at Hotel. Day 02:Pre-trip meeting and sightseeing around Kathmandu After the pre-trip meeting, your sightseeing trip will start at around 8:45am. You will have a private vehicle and a professional tour guide at your disposal. We visit Boudhanath Stupa, one of the biggest Buddhist shrines in the world, where we observe Buddhist monks praying in the monasteries surrounding the stupa. After Boudhanath Stupa we visit Pashupatinath, the most famous Hindu temple in the country, located on the banks of the holy Bagmati River. Here we see Hindu holy men (sadhus) meditating, pilgrims bathing and occasionally funeral pyres burning on the ghats. We then head towards Swayambhunath – also called the Monkey Temple - a Buddhist stupa perched atop a hillock on the western side. You get a magnificent view of the valley from here. Overnight at hotel. Day 04:Fly to Jomsom (2,700m), assemble the bikes, and ride to Kagbeni (2,900m) On this day, we will take a morning flight to Jomsom from Pokhara. 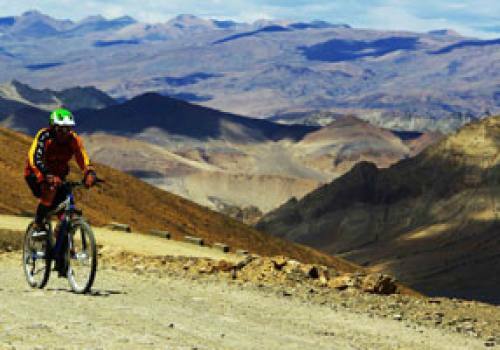 After reaching at Jomsom, bike to Kagbeni, which lies in 2,810 meters altitude. Overnight at hotel. Day 05:Ride from Kagbeni to Muktinath Today after breakfast, ride from Kagbeni to Muktinath (approx 2,760 m). The landscape is extremely dry and desert-like. 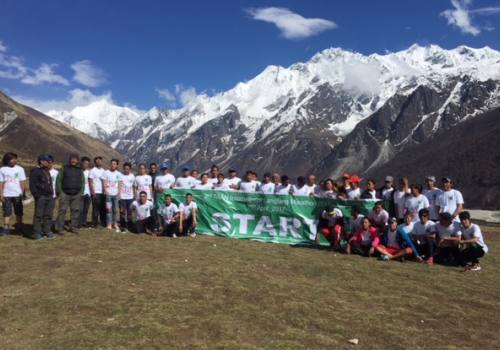 You may come across a handful of trekkers and pilgrims, mainly from India, on their way to the holy temple with the eternal flame in Muktinath that burns from a natural gas source. Reaching the culturally and religiously site with stunning mountain views is quite an achievement. Overnight at hotel. Day 06:Ride from Muktinath to Chele After breakfast, we will ride to Chele (3050 m) from Muktinath. Overnight at Tented Camp. Day 07:Ride from Chele to Syangboche Today ride from Chele to Syangboche (approx 3,840 m) along the biking trails that will offer beautiful sceneries. Overnight at Tented Camp. Day 08:Ride from Syangboche to Charang Ride from Syangboche in the morning to get to Charang, which lies approximately 3,560 meters above the sea level. Overnight at Tented Camp. Day 09:Ride from Charang to Lo-Manthang Today ride from Charang to Lo-Manthang. Lo-Manthang that lies 3,810 meters above the sea level used to be the capital of ancient Kingdom of Mustang. The place does not only carry a great historical significance but it’s also culturally rich. Overnight at Tented Camp. Day 10:to 11: Explore around Lo-Manthang These days are for rest and exploration of Lo-Manthang. Explore its cultures, people and geography. Overnight at Tented Camp. Day 12:Ride from Lo-Manthang to Gami Today ride from Lo-Manthang to Gami (3,520 meters). Overnight at Tented Camp. Day 13:Ride from Gami to Samar Ride from Gami to Samar (3,520 meters above sea level). Overnight at Tented Camp. Day 14:Ride from Samar to Chheusang Our destination is back to Kagbeni (2,810 m). But this time, it’s from Samar riding. Cycle downhill to Chheusang. Overnight at Tented Camp. Day 15:Ride from Chheusang to Kagbeni Ride to Kagbeni uphill again. Overnight at Guesthouse. Day 16:Ride from Kagbeni to Tatopani Today we have the longest ride of the entire tour. 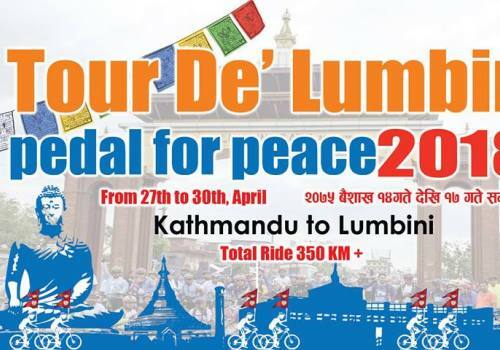 We’ll ride 74 kilometers, from Kagbeni to Tatopani. Tatopani lies above 1,190 meters from sea level. Overnight at Guesthouse in Tatopani. Day 17:Ride from Tatopani to Beni and Drive to Pokhara Ride from Tatopani to Pokhara. It is an easy ride of about 18 kms. We’ll do sightseeing around Pokhara. Overnight at Hotel in Pokhara. 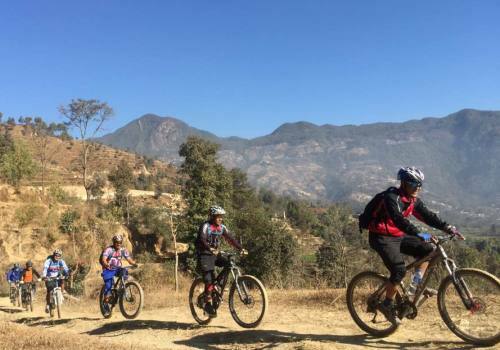 Day 18:Guided Activities at Pokhara in private vehicle or on Bike. This day, we’ll visit Phewa Lake, Davis Fall and Mahendra Cave. Overnight at Hotel. Day 19:Pokhara to Kathmandu drive by Tourist vehicle, 7 Hrs. We’ll drive back to Kathmandu. Farewell dinner at a Nepalese restaurant with cultural program. Overnight at Hotel. 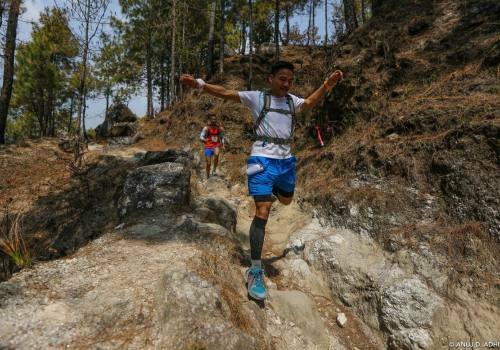 Day 20:Final Departure from Nepal. Our representatives will take you to Tribhuwan International Airport for the final departure. You also have options to extend the tour.